Individual Training - athletes train with a performance coach on a one-to-one basis. This is for the athlete who desires individual attention, which allows us to devote all our time and resources on meeting your individual needs. Small Group Training - athletes train with a performance coach in a small group, generally no more than 4 athletes. This is a great way to train and exceptional value as athletes continue to receive training according to their individually tailored programs. Team Training - athletes train with a performance coach as a team, ideal for school or club teams. Not only will you see improvements on an individual basis, but also as a team. Before starting a performance training program, our performance coaches will take you through a complimentary consultation that consists of a movement screen and goal assessment. This consultation generally takes 60 minutes. Movement Screen - The movement screen is a series of tests that allows us to determine if there are any muscular imbalances, inefficient movement patterns, and joint dysfunctions. We are also analyzing postural stability, flexibility, and explosiveness. Goal Assessment - After a movement screen has been conducted, we will sit down with each athlete and their family to discuss its results and find out what are the athlete's goals. With this information, we can develop a training program that specifically addresses the weaknesses, inefficiencies, and goals of each athlete. Pillar Strength (Core Strength) and Balance - training that concentrates on joint stabilization and core (pillar) strength. Exercises are performed to increase the stability of major joints such as the spine, knee, shoulder, hip, and ankle. Movement Preparation - a technique to prepare the athlete to perform sport-specific movement skills. It is an active warm-up that allows the body to increase range of motion through the shoulders, hip, knee, and ankle. Movement Training - focuses on sport-specific movements. The movement skills being taught depend on the sport being played. For example, a golfer will train to make hip rotation more efficient and explosive, while a volleyball player will work on her jumping and landing technique. The goal of this training section is to create optimal movement patterns to decrease the potential for injury and increase the athlete's explosiveness. Strength Training - designed to increase force production and the rate of force production. We train multi-joint movements designed to challenge body awareness and postural stability. Sport-specific movement patterns are also implemented to increase the coordination and strength of that particular movement. Programs are designed to ensure athletes are performing at their peak during competition and are able to maintain that level throughout the season. Energy System Development - focuses on increasing an athlete's endurance and stamina. Based on the results of the iMETT test, sport-specific endurance training programs are designed to allow athletes to play at optimal levels of intensity for the entire match. Regeneration / Recovery - the ability to recover and regenerate your muscle tissue is the limiting factor in performance training. At the conclusion of each training session, athletes perform self-massage and stretching techniques to enable their bodies to recover faster. Post-Workout Nutritional Shakes - are also consumed to aid in the muscle recovery and building process. Athletes are assessed throughout their training to monitor progress. The amount of time spent in each section will vary based upon the needs of the individual and the phase of training. Our training methodology consists of three main sections; Joint Stability/Mobility, Strength, and Power. Each section has multiple phases and progressions. 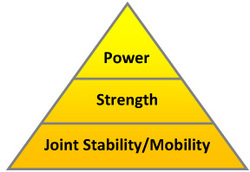 It is similar to a pyramid as you must first start with a solid foundation, Joint Stability/Mobility. The Strength section is then built upon this base and then finally Power can be developed. One of the faults of traditional training programs was that they ignored the Joint Stability/Mobility aspect of training. Traditional or "Old School" strength coaches like to see heavy weights being lifted and take pride in developing massive muscles. One of the problems with this methodology is that it does not adequately prepare the body for athletic competition and thus, the incidence of injury rises. The failure to train joint stability and mobility leaves the athlete vulnerable to overuse injuries and other non-contact injuries. Think about what happens when an athlete gets injured. The athlete usually goes to physical therapy, where the therapist works on either increasing the strength of the muscles that stabilize the injured joint and/or increasing the mobility of the injured joint. We feel a better training approach would be to start with joint stability/mobility training first so that we can reduce the potential for those overuse and non-contact injuries. It is about being proactive so that our athletes can remain in the game rather than reacting to an injury that could have been prevented. On the other hand, many "functional trainers" or trainers with rehabilitation backgrounds tend to only live in the joint stability/mobility section with very little strength and power training. The problem with this methodology is that it does not develop explosiveness. The injury potential of the athlete is reduced, but at some point strength and power need to be addressed in order to increase explosiveness. Let's use a car as an example. Think of joint stability/mobility training as a tune-up and oil change for your car. Immediately after the tune-up your car is running great and you can really tell a difference in its performance. However, there is a ceiling to how well your car performs. Every time you get a tune-up, your car will reach that ceiling of performance. But what if you want your car to perform above that ceiling? Well, you need to do something more than just a tune-up. You need to increase the horsepower in the engine so that your car can be faster. That's where the strength and power training come in to play. Strength training adds horsepower to your engine and allows your car or athlete to move more explosively. It really is a combination of Joint Stability/Mobility, Strength, and Power training that allow an athlete to perform at their best while also decreasing the risk of injury. Expertise is not in knowing there must be a combination of joint stability/mobility, strength, and power training; it is in knowing when to utilize each section and how long to emphasize each section. Our assessment and evaluation allow us to truly create custom training programs to cater to each athlete's needs and goals. By manipulating variables in each training program to meet specific individual needs, we can achieve greater results in a shorter period of time. At Tactical Strength & Conditioning, we develop powerful athletes! To get a better understanding of this, we must first define what it means to be explosive, powerful and strong. Many people use these terms loosely and carelessly. We will try to define these terms to create a clear understanding of how they differ from and/or relate to each other. We define strength as the ability to exert force on an object using one's muscles. In other words, strength is how much weight you can move or lift. On the other hand, power is defined as the rate at which work is performed. Before we can go any further with this, we must define work. Work is the amount of force being applied to an object and the displacement of that object or how far that object moves as the force acts on it. Thus, power takes into account the amount of force on an object (or strength), how far the object moves, and the rate or how much time it takes to move that object. Basically, strength involves your ability to lift or move an object. While, power involves your ability to lift or move an object, as well as, how far and how fast you move or lift that object. Explosiveness, is just another term used to describe the amount of power an athlete possesses. Applying these terms to lifting weights, a strong athlete can squat 400 pounds. A powerful athlete can squat 400 pounds in 3 seconds. An even more powerful athlete can squat 400 pounds in 1 second. Who would you rather have on your team? Applying these definitions to sport, it seems evident that performance is linked closely to power, as opposed to strength. For example, in football, would a lineman be more successful merely applying a force to his opponent (strength), or applying a force quickly, moving his opponent a certain distance (power)? If the lineman does not apply his force quickly, he will lose. If the lineman does not move his opponent, he will lose. Let's look at another example. In baseball, would a batter be more successful just swinging the bat or would he be more successful if he swung the bat fast? Those examples seem pretty obvious, now let us examine how these concepts apply to running. The force being applied in this example is the athlete's foot pushing into the ground. A strong push will result in a lot of force being applied to the ground. A powerful push is a fast force which moves the athlete. Therefore, in a race or competition, the athlete who can apply force to the ground the fastest which also moves him/her a greater distance wins every time. It is not enough to just push into the ground. You must push your foot into the ground fast and with enough force to move your body a great distance. Performing better in sport is about being more powerful. Power enhances your skills and tactics to enable you to perform them faster. Strength is a component of power. The major difference between strength and power is speed! You do not need to be fast to be strong, but you must be fast to be powerful. This is why our "Record Board" only has categories such as vertical jump, broad jump, top speed, highest wattage for trunk rotation, etc. All of these events have a speed and power component to it. Other gyms and weight rooms have categories such as bench press, squat, deadlift, pull ups. These events are strength based. Strength does not matter in sport if you cannot use it powerfully. At Tactical Strength, we develop powerful athletes! Strength simply does not transfer as well to sport. It is a paradigm shift. Start thinking in terms of power when referring to athletes and performance.